How did you make out with your swatch? Did you decide on your needle size, yarn and finished afghan size? Now we get into the fun part, the knitting. Below is a schematic of the entire afghan. The dark lines are drawn around the various puzzle pieces. 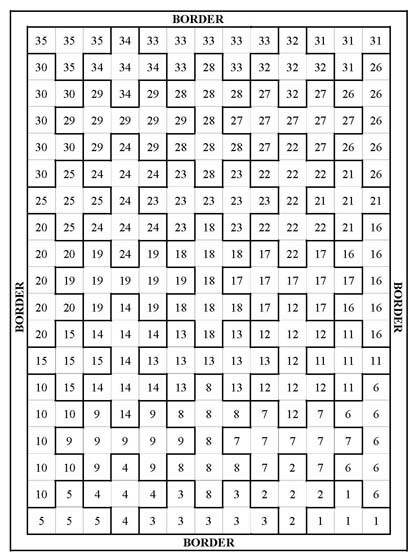 The pieces are also numbered to help you to know what color to knit for each block. 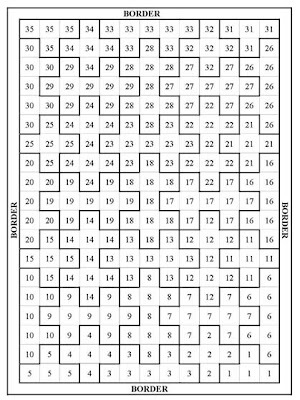 For example, starting in the lower right-hand corner you'll see blocks #1. They will all be knit in the same color. In my case, these are green. You can repeat the colors are often as you like. You can make #1 to be green, and #28 can also be green. The choice is totally yours. If you're going to plan your colors, you can print the schematic (it's a .jpg) and color it in. I'm doing mine randomly. I have lots of colors and will just pick whichever one appeals to me to knit next. Again, your choice. No rules! Click to enlarge. Use your Back button to return here. ﻿ You already have your first square finished. Next up is another block in the same color (another #1). With the right side facing pick up and knit 20 stitches on the left side of the first block. Note: I cast on 40 stitches for my first block (the swatch) and this is half of that number. 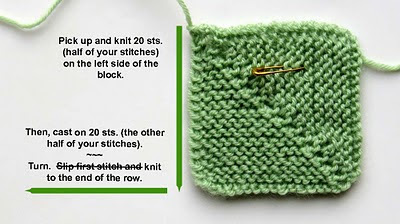 If you cast on a different number of stitches, then you will be picking up half of your number. Cast on 20 stitches (or half of your number). There are 40 stitches on the needle (your total number of stitches). Turn. With the wrong side facing knit to the end of the row. Do not slip the first stitch on this row only. From here on you'll be making the square the same way that you did the swatch. *Good news* - When you have completed your block, and if the next block to be worked is the same color, DO NOT BIND OFF. Simply enlarge the loop (last stitch) and pass the entire ball of yarn through the loop and tighten. You're now ready to pick up the stitches and you'll have 2 fewer ends to weave in! Work the entire first row of the afghan. Next up, on Sunday, I'll give you directions to continue onto the next row. Then, you'll be able to complete the entire afghan, except for the border. Questions? Please go to the Ravelry group discussion board, click here. If you find any errors in this post, please email me: joanne @ jconklin . com (remove the spaces).